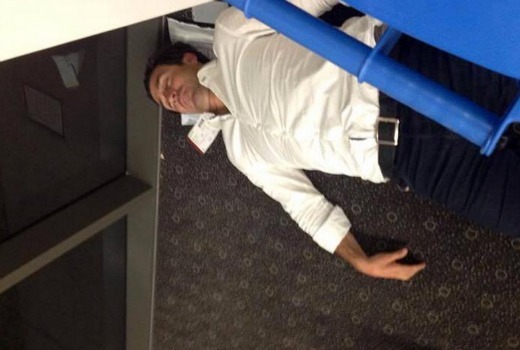 Nine yesterday stood down Andrew Johns from the NRL Grand Final broadcast following an alleged intoxication incident at Toowoomba airport on Friday night. Johns was photographed on the floor of the airport accused after allegedly propositioning a married woman. Helen Wright criticised his behaviour on Facebook writing,”I wish that football commentators [had] more pride and a much higher standard of behaviour in public. Johns did not appear on Nine’s Sunday Footy Show, and was dropped from Nine’s Grand Final broadcast last year. “We’ve made the decision to stand him down,” Nine Sports director Steve Crawley told the Daily Telegraph. “I spoke to Andew several times yesterday and we made the decision last night. Johns, whose contract with Nine has now expired, denied he “passed out” and said he lay down. He later apologised to Helen Wright. Nine’s football talent continue to attract headlines including Beau Ryan, Billy Brownless and Brett Finch. Let’s see whether they are serious or whether they will have him back next year as if nothing happened? Ok, so maybe his behaviour was inappropriate for a TV sports commentator, but what this woman has done, by photographing him and making a complaint, has possibly effected his working future. I think she might be regretting the mountain she made out of a molehill. Maybe he should have just behaved himself and then there wouldn’t be a photo or story. Shocking that actions have consequences isn’t it? Having a camera on you is great except for when you’re acting like a goose. Welcome to the look at me, me, me era! According to Johns in the Telegraph it wasn’t the woman who photographed him it was a bloke. You can’t blame the woman for John’s behaviour.